Yes, you read it right. I did say “creating videos USING PowerPoint”. Here’s a little background before we delve into it. Almost everyone at Chillibreeze is well versed in PowerPoint and its uses. Not to forget Microsoft Office Specialist Certified! It is our core service after all and a big chunk of our design work for customers is done using PowerPoint. PowerPoint is a way of life now. We are so used to it that even our personal assignments are done on PowerPoint. It has become a hard habit to break. Here is everything you need to know about PowerPoint formatting. We would even go as far as to create amazing videos using PowerPoint. Microsoft keeps updating its applications which works well for us because we cannot think of using any other tools for creating graphic designs or videos. Guess what! PowerPoint will soon be able to support visual and motion 3D modeling! But before the excitement gets over our heads, let us get to the essence of how to actually create a video using PowerPoint. Do you have a deck of slides ready with the its content in place? Good. Adding animation to your slide content brings your story to life. They produce an illusion of movement and thus amplifying the impact of your content. You can decide on how, when, where and at what interval content in your slides should appear or exit. Pick an object or group of objects you want to animate first and then go to animations. Pick an option that best fits your content. There are 4 levels of animation you can add to an object. Entrance, emphasis, exit and motion effect. If your slide is filled with content, and you want to add varied animation effect, it can get complicated. Try to not over burden a slide with animation because this will degrade the function of the slide. On the further rightof the animation panel, you have the add animation option, which allows you to add enhancements to the animation on an object that you have already animated. You can also use the animation pane to show you all the existing animations that you have used. Use trigger to add what happens to an animation. When you want to use the same animation for two objects, and you have not added an animation yet to the second one, select the first object then select animation painter and click on the second object. Now the second object will have the same animation as the first. Now we get to the timer where you can decide when an animation should start or end, the length of the animation and delays if any. You will see to the far right; an option where you can reorder animated objects to move earlier or later. To do so, select the object that you want to move and click on move earlier or move later. Yes, I know this is a lot of brain game and content placement strategy, but animation is an essential part of converting a PowerPoint into a video. Video without audio would not grab much attention. Because it is a video, your viewers would expect it to come with audio effects. There are several ways you can add audio to your PowerPoint. 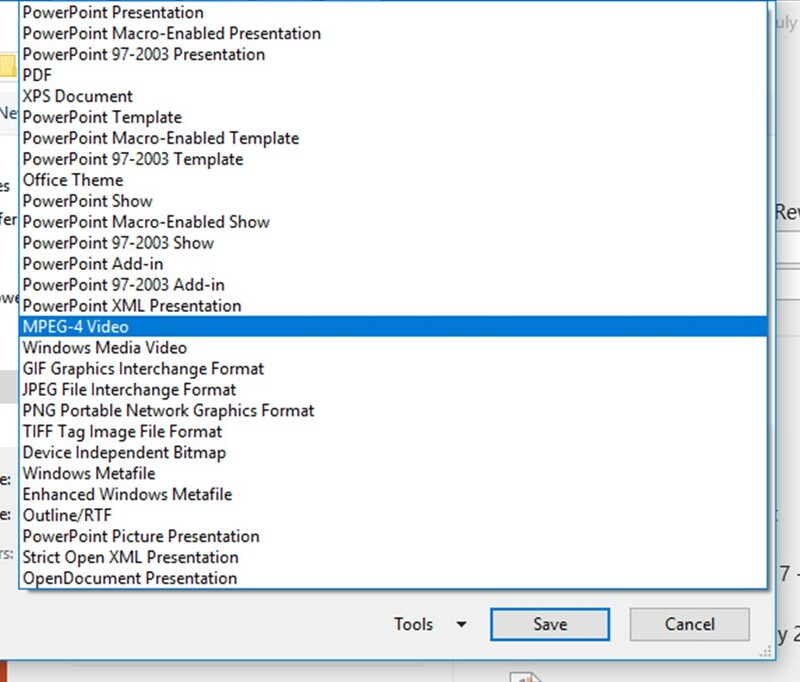 You can add the sounds from PowerPoint itself, but who wants to do that. I am sure you would have your own collection of sounds you want to use for the presentation. Go to Insert > Audio and select the audio that you want to use from your computer. Keep the audio icon outside of the slides. Time it with the animations and slides as required. 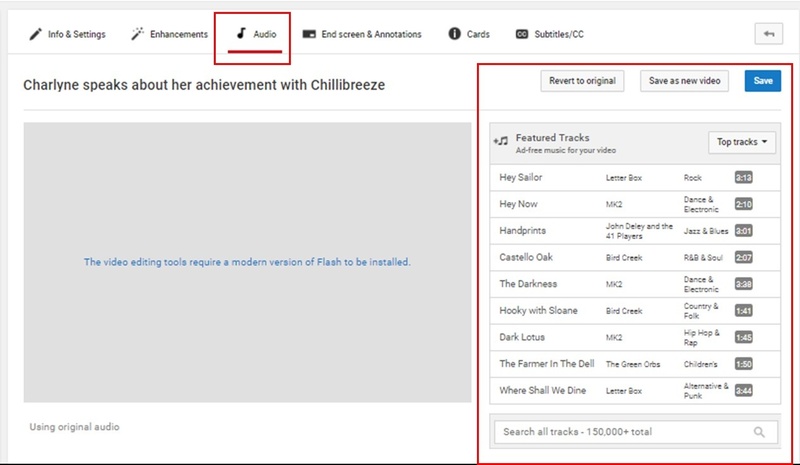 If you are planning to upload the deck/video on YouTube, there are a lot of free audios you can pick from YouTube itself. You can do that while uploading your video. When you are done with all settings, go to audio. Towards the right-hand side of the video editing, you will see a list of free sounds. There are more than 150,000+ you can pick from. Transition animates the slide as a whole. Go to transitions and pick the one that best suits your slide. After you have selected the transition choice, towards the far right of the transitions setting you have the time settings. You can select the duration at which the slide can be viewed and if you want it “on mouse click” or you want to the slides to change after a period of time, just check against the box. 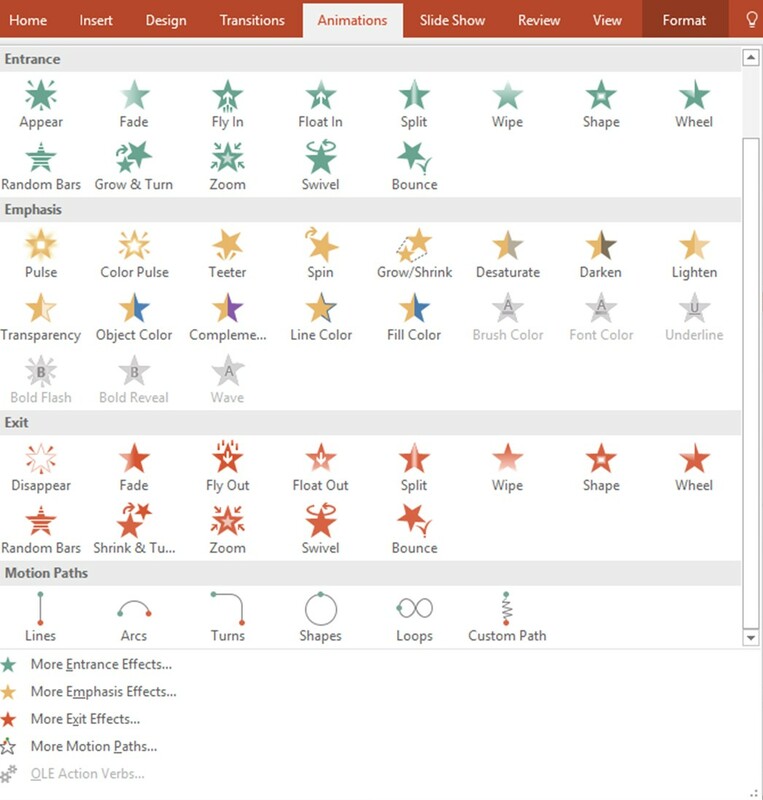 Depending on the style and content of your PowerPoint deck, you can use different transition styles for different slides. But if you have consistent slides, best advice is to select just one transition style for all the slides. Now that we have everything in place, the last step is converting your animated PowerPoint into a video. Before you convert, do a last check to see everything is in order with no misplaced content or animations on the slides. Select File > Save As > On save as type select MPEG-4 Video. VOILA! Now you have a video created out of PowerPoint! It will take a few minutes for your presentation to be converted into a video. Here is an example of a video created purely out of a presentation by one of our PowerPoint experts using the 4 simple steps I explained here. It might feel a little complicated when you are working on your slides, adding animations and transitions. But once you get the hang of it, you will realize that they are very easy to create. Have you tried creating videos using PowerPoint? Tell us more by leaving us a comment.